One Source Equipment Rentals has diesel powered towable generators for rent or sale from Atlas Copco, Coleman, Magnum, Terex, and Wacker. 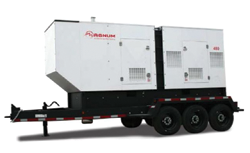 These towable generators are designed to provide power for special events, planned shutdowns, and use as a standby power source. There are convenience receptacles like twist locks, and GFCI Duplex receptacles as well as lugs for direct wiring. We have models that range in size from 20kW up to 419kW. For smaller generators see portable generators. For basics about electricity and help selecting the right towable generator for your job see (MQ Generator Handbook).